The Millenium Stadium was built in 1999 to replace one of the great spiritual homes of world rugby, Cardiff Arms Park. Constructed at a cost of £126 million, the new arena was a central part of Wales' hosting of the 1999 World Cup. There were doubts that the new arena would be able to reproduce the spine-tingling atmosphere of the Arms Park, but these were quickly dispelled. The retractable roof, which can be left open or closed to the elements as required, adds to the appeal of the stadium. With the roof closed, the 'hywl' generated by the passionate home support, which always dominates the 74,500 capacity, makes it an electrifying place to watch rugby. Wales were unable to feature in that Rugby World Cup final of 1999, in which a Tim Horan-inspired Australia overpowered France in a lacklustre final 35-12. The ground has also welcomed three Heineken Cup finals, in 2002, 2006 and 2008, with Leicester winning the first, and Munster the last two, making it a lucky ground for the Irish province. The national stadium of Wales hosts both football and rugby internationals, and was home to the English FA Cup and play-off finals during the lengthy reconstruction of Wembley Stadium. The multi-purpose venue also hosts concerts, boxing matches and motorsports events with unrestricted views from all seats. The steep upper tiers and numerous hospitality outlets mean a visit to the Millennium Stadium is never disappointing. Cardiff is literally taken over by rugby fever on international days, as traffic and normal city centre life stops. The pubs of St Mary Street are packed to rafters with supporters, and the City Arms on Quay St, set just across from the ground, is a particular favourite with rugby fans. 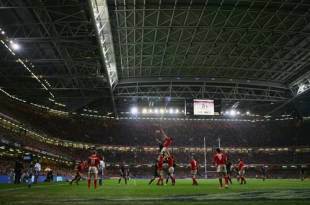 It will make a wonderful venue for the 2015 Rugby World Cup, with the ground having already been pencilled in for two of the quarter-finals.